I’ve seen a lot of expensive bottles of alcohol. I worked in a liquor store for awhile and spent many days dusting top-shelf booze that nobody bought. 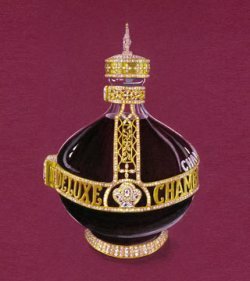 However, I’ve never seen a bottle of alcohol that was more expensive for what was on the bottle than what was actually inside the bottle, which is the case with Donald Edge’s $2 million dollar bottle of chambord. Commissioned for London Fashion Week, the newest Guinness World Record holder for “Most Expensive Bottle of Spirits” can now be seen outside of Anna Friel’s Breakfast at Tiffany’s at the Theater Royal Haymarket’s chambord bar. That brings to mind one question; if you have $2 million dollars to spend, could you buy that bottle and take it home? If Kanye West shows up to interrupt Anna Friel’s performance on stage to talk about how much better Audrey Hepburn was in the role, could he party after the show with a record-breaking bottle of raspberry liqueur? Another question is, who made the chambord inside the bottle? Is it the good stuff, or is it knock-off liqueur? If I’m spending that much on a bottle, it had better contain the best hooch money can buy! These are the things I wonder about when I have a little free time.